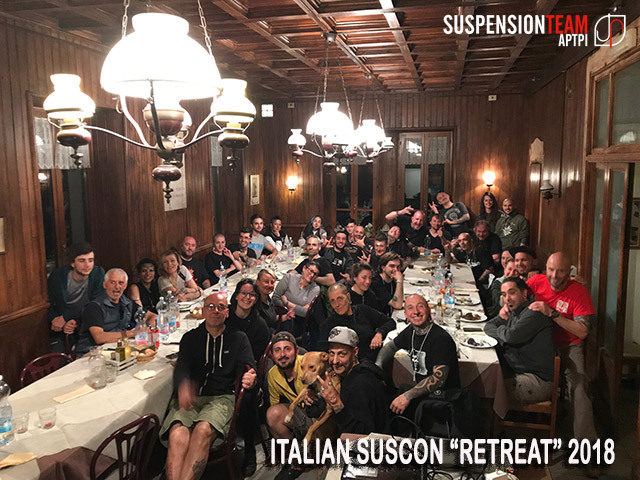 From the 27th to the 30th of MAY 2018 in the lodge Carlo Porta in Piani dei Resinelli province of Lecco italy , an unexpected event took place, the first italian suscon retreat. For this year the aptpi-st wanted to change and create a special and intimate event ; infact the retreat was open to only 40 people , this was done to create a really unique atmosphere. The change wasn’t only in the intimacy of the event, but Also for the fact that there were extra activities,added to the suspension ,( fulcrum of the event as always) that entertained all guests for the 4 days. Lessons of fitness , climbing trekking kept people engaged with teachers Flavia Stramazzo (fitness) member of aptpi-st and Marco Corti (climbing and member of CAI) Who Also heald a class about simple knots one evening. These extra events were tiring but were Also well payed , by host Mauro Gaddi Who knew how to make the guests happy with every type of menù request, traditional lunches and dinners with onnivore/veggie/Vegan options with fantastics Hors d’oeuvre. An exeptional view typical of lake como that the most brave could see from above taking a 4 Hour hike to the top of mountains. We can’t wait until next year arrives. Ps:A day of Rain and lightining that Made everything more spettacular.